Jura is situated on the Isle of Jura, which sits off the west coast of Scotland. What seems like a stone throw away sits the famous Isle of Islay to the north east… and we all know what that means, PEATED WHISKY! The Jura superstition is a peated whisky with a mysterious character that is not easy to figure out; its gentle flavours are almost cryptic as they need lots of attention to fully appreciate. Some whisky experts do not like this whisky very much, but I find its smoothness to be a welcome shift away from some of the ferocious peated whiskies on the market. Much like Smokehead, it offers a lovely peat experience without the overkill (Big Peat, Johnnie Walker Double Black are examples of peated whiskies that, in my view, are simply too intrusive on the taste buds and inundate them with peat which unbalances the experience). Interestingly, the whisky expert that does not much like the Jura Superstition enjoys very much the Big Peat and Johnnie Walker Black Label. 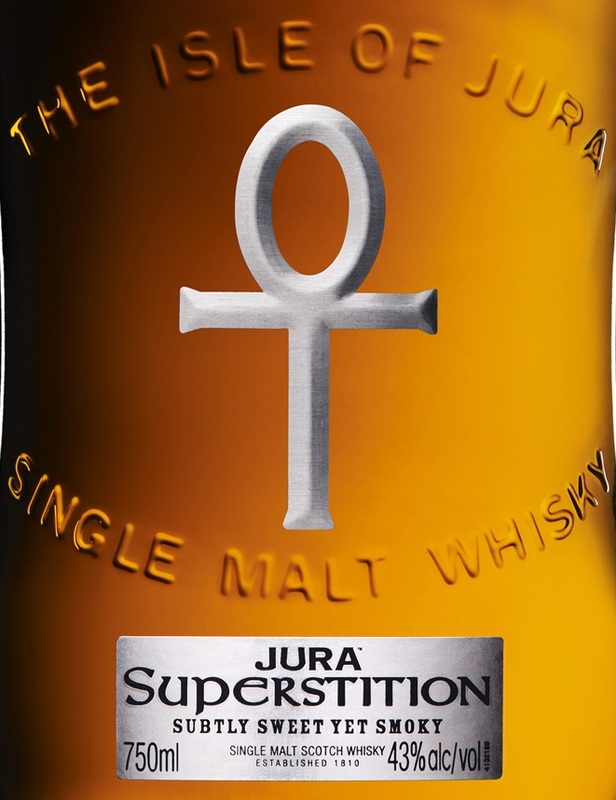 In creating the Jura Superstition the Jura distillery have not mindlessly followed the peated whisky crowd. Instead they have scrubbed away some peaty roughness to produce a mild mannered peated whisky that courteously allows the taste buds to realize what is happening before the smoky peat comes rolling in! The smoke then develops on the palate with sparks of honeyed sweetness. It may be overly smooth for some, but if you enjoy a suave and sophisticated peated whisky that needs some careful exploration this might be for you!